Due to weather conditions and ice. The Hillsboro School District will not be in session on Thursday, February 28, 2019. FYI: Buses that head south on Old Hwy 21 are stopped in traffic due to a wide load truck that is traveling 1 to 4 mph. Please allow extra time for your students to arrive home safely. These buses include 9, 12, 19, 23, and 60. Thank you for your patience! Each year the Hillsboro R-3 School District selects a Support Staff Person of the Year. These candidates are nominated by their peers, staff members, parents of students and patrons of the District. Nominations can be made through this link, https://goo.gl/forms/b6rm4dV3gxTXIaiS2 and must be submitted by February 6, 2019. Any full-time or part-time support staff member including secretaries, paraprofessionals, nurses, custodians, food service workers, bus drivers, mechanics, maintenance techs, technology department staff members are eligible. Candidates should be skilled, dedicated, and hard-working. The nominations for each finalist will be given to the District selection committee. The selection will be made by the end of February and the District winner will be announced at the Annual Staff Recognition Dinner held in March. Please help us recognize our dedicated Hawks support staff members and fill out the form online with your nomination! EARLY RELEASE UPDATE January 11, 2019 - 8:30 am Due to the anticipated earlier arrival of the inclement weather. The Hillsboro R-III School District will dismiss students THREE hours early. Friendly Reminder: Thursday, December 20 - The HSDR3 Board of Education invites you to formally join us in welcoming our new 2019/2020 Superintendent, Dr. Jon Isaacson from 2:30 - 6 p.m. at the Hillsboro Learning Center. Parents/Guardians, Faculty/Staff, Patrons/Businesses are all invited. Hope to see you there! Friendly Reminder: Today (12/16/18) @ 2 p.m. - Hillsboro HS Band Annual Holiday Concert @ the HHS Auditorium - Admission is free! The Hillsboro HS Ecology Club is working with Jefferson County Recycling and invites you to 'Recycle the Holiday'. Thursday, December 27 from 9:00 a.m. to Noon @ the Hillsboro Civic Club located at 10349 Business 21 in Hillsboro. The Ecology Club will be helping unload cars and sorting items... This event is open to the community! Spread the word! 11/28/2018: An all-call message was sent to parents and guardians of HS students: "At around 2 pm, the High School Administration and Law Enforcement were notified of writing on the wall in the boy’s restroom that stated “Let’s shoot up the school”. An investigation was immediately begun and additional security measures were put into place. In light of the recent events at the junior high and high school in the restrooms, beginning tomorrow, there will be limited access to the restrooms during instructional time and the bathrooms will be closely monitored by staff during passing periods. Parents/ Guardians, we ask that you visit with your child regarding the seriousness of these actions. Students who make any type of threats will receive serious consequences." An all-call message was just sent out to JH parents and guardians: "This morning a graffiti message was found written in the girl's restroom of the Junior High School. The message threatened to “shoot the school up”. As always, the safety of students and staff is our top priority. Law enforcement was immediately notified. The Junior High students, faculty, and staff were put on a modified lock-down. In order to verify that no threat exists, student lockers and bags are being searched. Once more details are available, we will send a follow up communication." 11/13/18 (10:15 a.m.) The Junior High is on modified lockdown due to a threatening message found in the girl’s restroom. All students will remain in 3rd hour and student lockers and backpacks will be searched as a result of the message. Law enforcement is at the Junior High. We will update you as soon more details become available. The Hillsboro HS Ecology Club, in coordination with Jefferson County Recycling, is sponsoring a Community Recycling Trailer at the High School on Thursday, November 15th for public use - for the Hillsboro R3 Community! ♻️ Accepted items are: Paper – Cardboard – Plastics - Aluminum -- ♻️ Gather your recyclables and do your part for the environment! ♻️ *no electronics will be accepted on this date. Hillsboro Junior High School would like to invite all veterans from the area to attend the Annual Veteran’s Tribute Assembly. The Tribute Assembly will be held in the gymnasium of the Junior High on Friday, November 9, 2018. There will be breakfast for all veterans from 8:00-8:45 AM with the assembly starting at 9:00 AM. We look forward to honoring the people who have served our country and would like the opportunity to say thank you. The Hillsboro High School Drama Department is proud to present "Schoolhouse Rock Live!" next weekend! - Showtimes and Dates: November 8, 9, and 10 @ 7 p.m. - Sunday, November 11 Matinee @ 2:30 p.m. - Tickets: $8 adults, $4 students. We are excited to announce Infinite Campus has two new apps available in the app store – Campus Parent and Campus Student (a new version of Campus Portal). Both apps include enhanced features to make it more useful for students and parents, with additional tools being added in the coming months. Once you download the app, you will be prompted to enter the District Name (Hillsboro) and State. Next, you will need to click Search District and select Hillsboro R-III from the list. Your username and password will be the same as the Campus Portal. Please Note: Campus Portal is still available, but will be phased out at the end of this school year. Students will be available to access the new Student Portal from their current Campus Portal. In the upper right corner, next to their name will be a green icon "Try the new Campus Student". If a student clicks on this link, they will see what the new portal looks like. Later this year after all new tools have been added, we will change the default to the new Student Portal. Please join us! Hillsboro R3 Superintendent Search Focus Groups facilitated by MSBA (MO School Boards Association) - Wednesday, October 10th - Hillsboro Learning Center located at 10486 Business 21 / 3:45 p.m. - Hillsboro R3 Staff and Personnel & 5:00 p.m. - Hillsboro Community and Patrons. First Responders Day! Student representatives from each building hopped on a bus and delivered donuts, cards, and banners created by our wonderful HAWKS under the direction of our Art Departments. We visited Hillsboro Fire, Hillsboro PD, Jefferson County Sheriff Department, Valle Ambulance, and Mapaville Fire Protection. The State Patrol moved to the Festus location so we will mail their cards and banners. 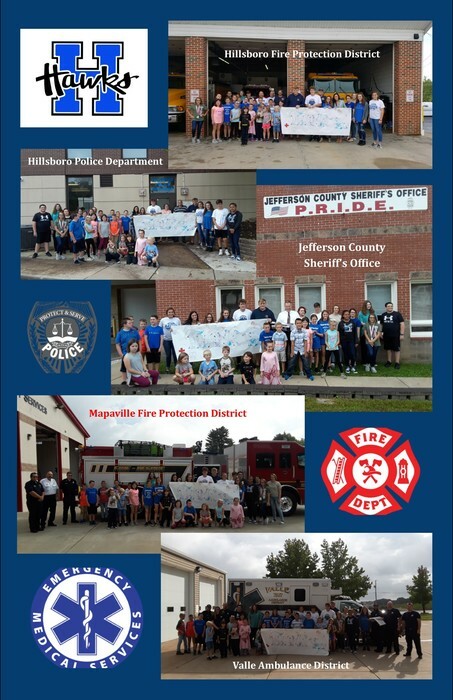 🚒🚑🚓🚔 We appreciate you sharing your students and their wonderful art work to honor the first responders in our community. Homecoming Parade Details - Friday, September 21 - Parade begins at 2 p.m. - Parade Route: Coming from behind the Civic Club through to the Primary, turning left onto Leon Hall Parkway, then right onto Business Hwy 21, left on Main Street (by Hardees), left onto Vreeland Road, continuing through the gravel pass-thru behind Casey’s, turning right onto Hi Crest Street rounding onto Hawk Drive behind the Intermediate, and ending at the Old Field House. Seventh and eighth grade students will be returning to the Junior High shortly. After searching the building with bomb sniffing dogs, there was no indication of any explosives found. Our students will be following normal dismissal procedures and times. Thank you for your patience, as student safety is our number one priority. This morning (8/28) a Hillsboro R3 school bus was involved in a vehicle accident off of Goldman Road. There were NO students on board the bus at the time of the accident. Thank you for your support of the Hillsboro R3 School District! fyi ✏️ K - 6 buses are rolling approximately ten minutes behind, they are on their way home! Please be advised that the buses for Grades K through 6 are running approximately 20 minutes late. Thank you for your patience. All students have been dropped off! Have a safe and wonderful weekend! The afternoon K-6 buses are rolling! Please allow an extra 15 minutes for your Hawk(s) to arrive home. - Have a wonderful weekend everyone! Again, for this afternoon's (K-6) bus run, we will post updates when the buses are loaded and on their way home - via Facebook (@HillsboroR3), Twitter (@Hillsboro_R3), the District website Live Feed (hsdr3.org), and the School Messenger All-Call System. Please like and share these posts to disperse the info to other Hawk family and friends! Thank you for your continued patience! All Hillsboro buses are in! Have a wonderful night and see you tomorrow! Our K-6 Hawks are on their way home! 😀 Please allow an extra 30 minutes for your precious cargo to arrive home! Have a great night! For this afternoon's (K-6) bus run, we will post updates when the buses are loaded and on their way home - via Facebook (@HillsboroR3), Twitter (@Hillsboro_R3), the District website Live Feed (hsdr3.org), and the School Messenger All-Call System. Please like and share these posts to disperse the info to other Hawk family and friends! 😊 Thank you for your patience! For your fridge - 2018-2019 School Calendar - http://5il.co/43ac 😊 First Day of School is Thursday, August 16th! Have you moved? To assure we have your most current residential and email addresses, phone number(s), etc., please complete and submit the Household Information Update Form linked here - http://5il.co/zom - You can check your information through the Infinite Campus Parent Portal. Public Informational Meeting - July 11 @ 6:00 p.m. at the Learning Center - This meeting will include presentations from two search firms discussing their processes in conducting the search for superintendent candidates for the 2019/2020 school year for the Hillsboro R3 School District. Was asked how I liked having summers off. I said Superintendents don't have summers off, but you never know what adventures await each day. School is out, Seniors have graduated, and business is picking up... Been a busy week. The Hillsboro Class of 2018 Graduation Ceremony will be going LIVE tonight! You can watch and share this momentous event with your family and friends. Click and Like the Hillsboro R3 Facebook Page. https://www.facebook.com/HillsboroR3/ Live feed begins at 6:30 p.m., with the ceremony beginning at 7 p.m. The graduation ceremony for Hillsboro High School has been moved to the Jefferson College Field House. Each senior received seven tickets for admission to tonight’s ceremony at graduation practice this morning. Graduating seniors will need to report to the Jefferson College Field House by 5:30 p.m. The ceremony will begin at 7:00 p.m. The reason for the last minute change of venue: in order to protect our turf field, we must use a specially made chair. Unfortunately, the chair company that carried the type of chair needed, no longer carries those chairs. We did not know this until this morning when they delivered chairs that had the potential to damage our field. No matter where our seniors receive their diplomas, this will be an incredibly special evening for everyone involved. Congratulations to three of Hillsboro’s finest! Seniors Justin Fitzpatrick and Jessica Madding and Junior Brendan M. Young graduated from Jefferson College May 19th with an Associate of Arts degree with a STEM focus. They were the first graduates of Hillsboro High School to complete an associate degree program while concurrently attending high school. Justin and Jessica will walk in their high school graduation ceremony tomorrow evening. Brendan will return to HHS in the fall to complete his senior year of high school. Hillsboro R3 buses will be running between 25-30 minutes late this afternoon due to vehicle accidents on highway 21 in town and south going towards DeSoto. These accidents are NOT District related. Thank you for your patience as we get your students home safely. Our Hillsboro Elementary Rockin' Hawks Choir performed at the Six Flags Music Festival this past weekend and earned a "1" Rating! Way to go Hawks! We had an awesome time at the 29th Annual Reading Awards Assembly at Hillsboro Primary.... It was a Boot Scootin Good Time! Yeeee-Haaaw! Last Friday, O.E. Brokerage, a family owned company out of Fenton, Mo came to Hillsboro Intermediate School to have a taste test with all the students in search of a new brand of Pizza for the school lunch program. O.E. represented Nardone Bros. Baking out of Pennsylvania. Nardone is also a family owned company that believes in making the best quality pizza. Rather than adding artificial ingredients such as imitation cheese to cut costs, Nardone believes in serving something students like to eat. The taste test went excitingly well and the students seemed to enjoy the pizza very much. Our kids are ready for the MAP test after our MAP Prep Bootcamp! Fourth grade is testing this week and third grade tests next week. We can do this! So it begins. The first Owner-Architect-Contractor meeting...Projected start date for the Proposition Hawks Building Projects - April 28. April 5th - The Hillsboro Board of Education will seek to approve and award the winning bid for the Propositions Hawks building improvements projects at a special called meeting this evening. Once a contractor has been selected, District officials will spend the next few days engaged in discussions with the contractor to determine the best feasible start date of school. Stay tuned for more information and thank you for your patience. 4/5/18 Board mtg-discuss bldg project&contractor. Will begin 2018-19 School Calendar discussion w/ contractor to finalize start date in Aug.
Yep.... 🌟 Star Wars was awesome....2018 JeffCo Honor Band. Great Job! SAVE THE DATE! HILLSBORO R-III DISTRICT JOB FAIR - SATURDAY, MARCH 24, 2018 - 8:30 AM - 12:30 PM - HILLSBORO INTERMEDIATE - COME VISIT WITH ADMINISTRATORS AND DIRECTORS ABOUT WORKING FOR THE HILLSBORO R-III SCHOOL DISTRICT! Early Childhood ECSE route backed into retaining wall.Four students on the bus were evaluated by EMS. No injuries- Students are headed home. AWESOME! Hillsboro Bands... Your performances was nothing short of spectacular...8th Grade, Concert, and Symphonic subsections - AMAZING! Due to the current forecast, timing of predicted icy conditions, and the uncertainty of impact of the weather on untreated surfaces, Hillsboro Schools will NOT be in session today February 21, 2018...Be safe. State of the County Address @ Hillsboro R-3. Second round buses running 15 minutes late due to a patron backing into parked bus @ the Elementary Bldg. Bus was NOT loaded with students. The Jefferson County Health Department’s “Smiles to Go Van” will be visiting our school district during the month of March. - In order for your child to participate/receive dental care you must complete and return to school the following forms BEFORE February 28th - It is the mission of the Smiles to Go staff to provide dental care to your child in a safe and pleasant atmosphere, promoting healthy dental hygiene for life. – Dental Cover Letter - http://5il.co/2qy8 - Dental Permission Slip - http://5il.co/2qy7 - Please contact the Smiles to Go program at 636-282-1010 or see the bottom of the linked cover letter for your school nurse’s contact info for further information, they will be glad to assist with your questions. Parents and Guardians may schedule Kindergarten enrollment/assessment appointments on/after February 2, 2018 by calling (636) 789-0050. Future Hawks are given screening assessments while parents/guardians complete the registration process. Assessment & registration takes between 45 minutes and 2 hours. Appointments may be scheduled for the following enrollment dates from 8:15 a.m. until 3:00 p.m. at the Learning Center located at 10486 Highway 21. - Wednesday, March 21; Thursday, March 22, Friday; March 23; Monday, April 9; Tuesday, April 10; Wednesday, April 11, 2018 - Children enrolling in Kindergarten must be age 5 by July 31, 2018. Parents must present an original birth certificate, current immunization records, and proof of residency in the Hillsboro R-III School District. Enrollment forms can be completed ahead of time and brought to the enrollment/screening appointment. Photo ID of Parent/Guardian must also be presented. - Enrollment forms may be obtained after February 2rd: On our District website www.hsdr3.org The Registrar’s Office at #20 Hawk Drive | The Primary School Office at 101 Leon Hall Parkway - If you have any questions you may call the Primary School Office at 636-789-0050 or the District Registrar at 636-789-0007. AWESOME presentation by HHS students in Civil Engineering & Arch. PLTW Habitat for Humanity concept designs... IMPRESSIVE! Please take part in nominating our 2017-2018 HILLSBORO R-III TEACHER OF THE YEAR - http://5il.co/2pl1 - Eligibility - Any full-time classroom teacher, librarian, guidance counselor, instructional coach and other similar position in the Hillsboro R-III School District may be a candidate. School personnel whose duties are primarily administrative or supervisory (Principals, Assistant Principals) are ineligible. Candidates should be skilled, dedicated teachers who plan to continue teaching. Once selected as a finalist the teacher is not eligible again for two (2) years. Nomination -Teachers may be nominated by their peers, parents of students, and patrons of the District. Nomination Forms will be made available in all building offices as well as the central office starting in December of each school year. Forms will also be published in the Superintendent’s notes and on the District Web Page. All nomination forms must be returned to the building Principal by January 30, 2018. Teachers may be nominated by their peers, other building staff members, parents of students and patrons of the District. Forms will be available via email, District Facebook page, and on the District website. Outside of District employees, please email your completed nomination form to frasca_jonelle@hsdr3.org District Employees, please return your completed nomination to your Principal. SAVE THE DATE! HILLSBORO R-III DISTRICT JOB FAIR SATURDAY, MARCH 24, 2018 8AM - 12 PM HILLSBORO INTERMEDIATE COME VISIT WITH ADMINISTRATORS AND DIRECTORS ABOUT WORKING FOR THE HILLSBORO R-III SCHOOL DISTRICT! Dr. Cornman thanking Julian for his help! Congrats Scott Readnour - 2018 Greater Hillsboro Chamber of Commerce - Citizen of the Year Award recipient... Proud of you Scott! HawkProud! Hillsboro WILL BE in session today. It's another great day for the Hillsboro Hawks to soar to new educational heights. It's cold outside, roads are clear, but the buses and buildings will be warm - see ya there. 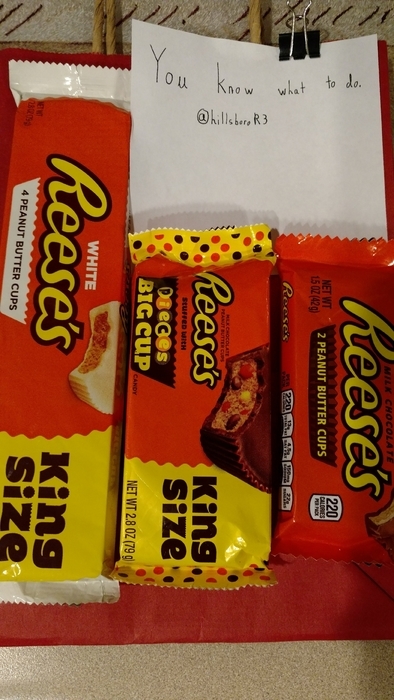 The first round of "Call School Off" candy has arrived. Students in my neighborhood really want a Snow Day!!! They remembered my favorite! Awesome learning experience at the Boat Float ⛵. Who knew learning could be so FUN! Thanks to Jefferson College for use of the pool. Primary, Elementary, and Intermediate present to STEM pact Board: Thank you for your support. FYI – Some 7th – 12th grade buses will be running late this afternoon, this will also affect the K – 6th bus run. Thank you for your patience. Absenteeism is on the rise! Parents, please expect friendly phone call reminders if students are absent requesting parental verification. FYI - False alarm at the Intermediate Building... Firefighters are in route, but no fire. Rest assured everyone is safe. A huge, heartfelt thank you to all who have served our country. We are truly the "Home of the Free" because of your bravery! November 1st... There is a chill in the air and it won't be long until DocC will be running roads on snow patrol. Winter is upon us! Download our handy app for all the latest Hawks info to your phone and/or tablet! Links for Apple App Store and Google Play are in the lower right hand corner of each webpage or simply search "Hillsboro R3" in your app store. Intermediate #Like-A-Girl will be hosting their Second Annual Character Breakfast on Saturday, October 7. Call 636-789-0030 for more information. SPIRIT WEEK 2017 STARTS THURSDAY, 9/21 AT HHS! School pictures for grades 9-11! Spirit Week kicks off this Thursday! Intermediate Principal, Scott Readnour, made a great video highlighting some tips in navigating around our new website. Please take a few minutes to watch the video below. https://share.viewedit.com/FLWt48CWQVPH1AnK3VSGHS Thank you for supporting the Hillsboro R3 School District!